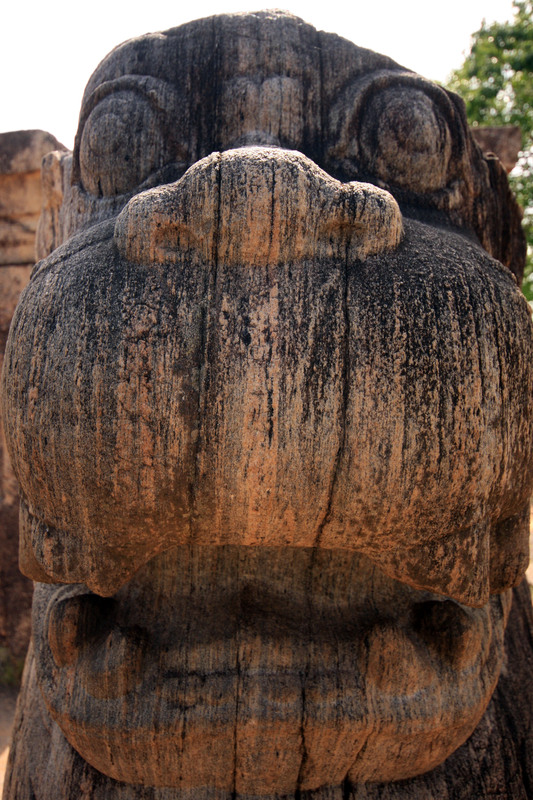 About one thousand years ago, Polonnaruwa was the capital of the South Indian Chola dynasty. 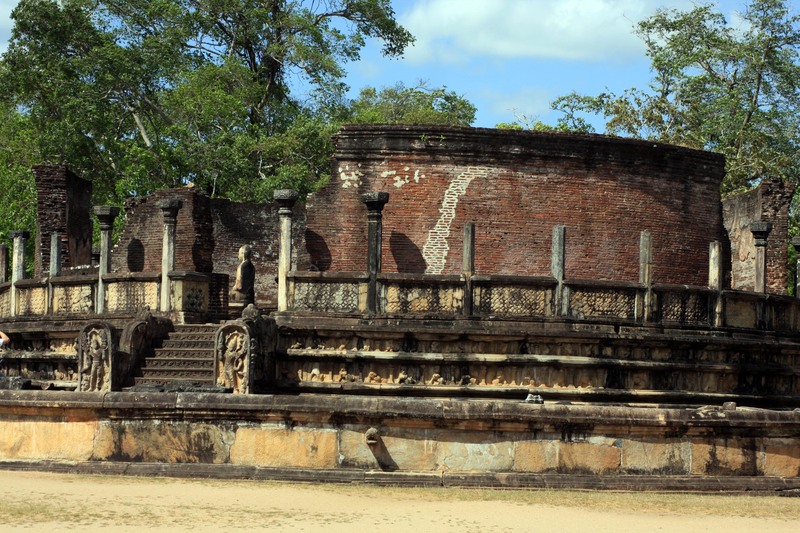 The Cholas had abandoned the previous capital, Anuradhapura, because it was less easy to defend against invasions from the Sinhalese in Ruhuna; but in spite of this King Wijayabahu managed to defeat the Cholas in 1070, and drove them off the island. 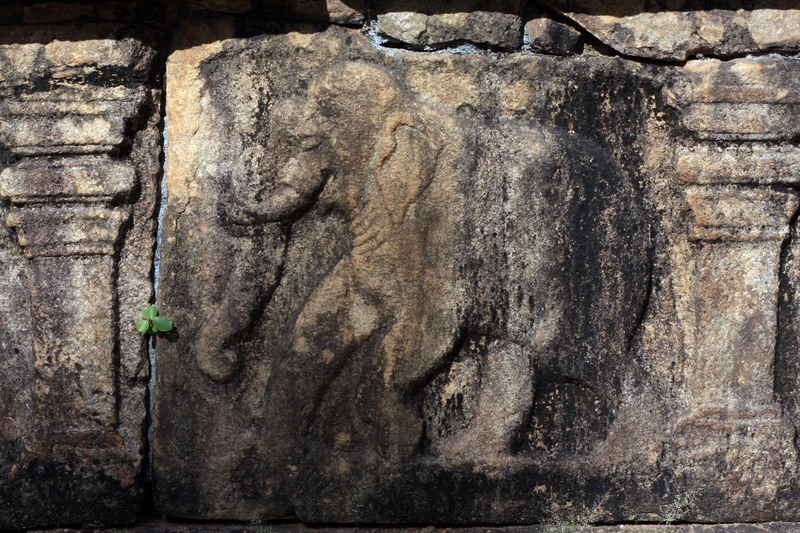 Polonnaruwa thrived under the rule of the Sinhalese, particularly King Parakramabahu (r.1153-86), under whose reign Sinhalese rock carving reached its peak. Now, of course, it’s all in ruins, but something of the splendour of that time can still be glimpsed. 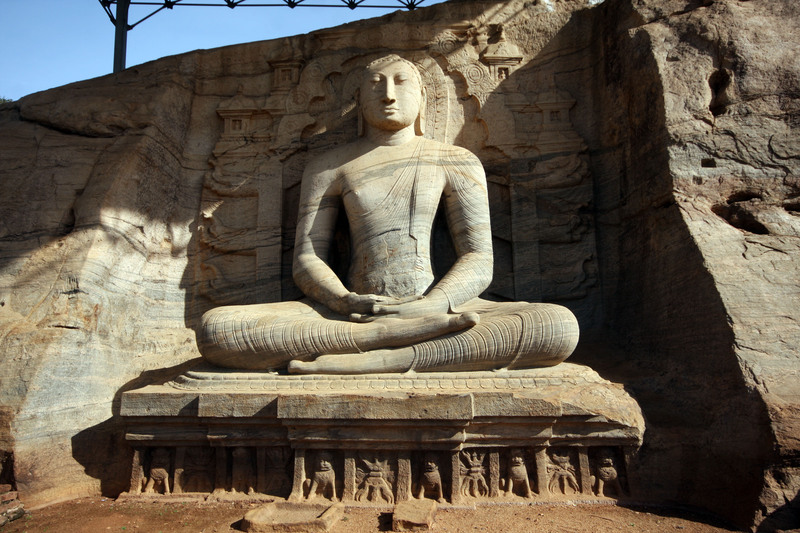 Ananda Malwathth Kankanamalage, aged 44, runs a stall near the beautiful Gal Vihara group of Buddha images in the ancient city of Polonnaruwa (as opposed to the modern city). It seems a pretty good place to work. I stop at Ananda’s stall for a rest during my exploration by bicycle, and he asks me if I’ve been as far as the Tivanka Image House yet. This building is the furthest north of the group and has a frieze of idiosyncratic dwarves carved around its outside. I tell him I’ve just came from there, via the empty Lotus Pond, where I almost fell off my bike in the thick sand. 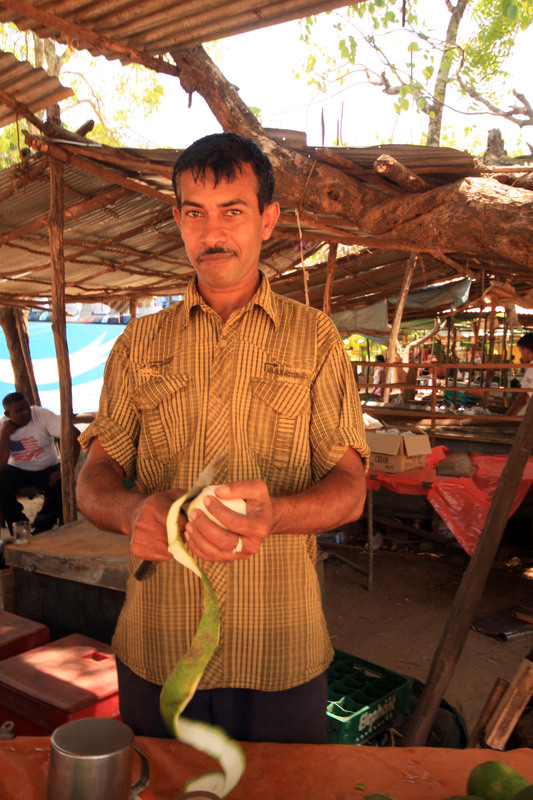 It is 9.30am and already hot, so Ananda recommends I try a thambili, or king coconut, as they’re very refreshing. These bright orange coconuts can be found all over Sri Lanka and are often sold in small bunches by local people at the sides of the road. The seller hacks at the coconut with a lethal looking knife and slices a hole in the top, out of which you drink the water. Afterwards, he or she will cleave the coconut in two and you can scoop out the soft white flesh inside. I eat a samosa next and Ananda tells me that from tomorrow all the stalls near Gal Vihara have been ordered to close.’They say the stalls are too ugly,’ he says, and I look up at the ramshackle corrugated iron roofs, tied haphazardly to the trees and supported with wooden poles, and concede the government has a point. Nevertheless, I feel sorry for Ananda, who tells me he has run his business here for 20 years and doesn’t know how else he will make any money. Another of the stall holders comes over, a man selling wooden carvings, and he says that the government plans to replace the makeshift structures with a proper, smart set of stalls, so in the end it could be an improvement, except that the work is scheduled to take 5 months. In the meantime, he shrugs, he will bring his carvings here in a box around his neck and sell them from under a tree. To cheer up Ananda I ask him to add some orange juice to my water bottle, and watch as he peels the green skin off the oranges in long curls. He also adds a little salt and sugar syrup, to ‘give it flavour’ and I decide that this makes it a passable dehydration mixture and might be a good idea. Seeing the ruins by bike is enjoyable and relaxing but it is best to start as early as possible, preferably just after dawn (I had no trouble getting in to the area at 7am) as it will be too hot to move by 11am. Go back to your hotel for lunch and a siesta and return late in the afternoon. It is enjoyable to watch the sun setting over the Polonnaruwa tank (large man-made lake), but don’t forget mozzie repellent! 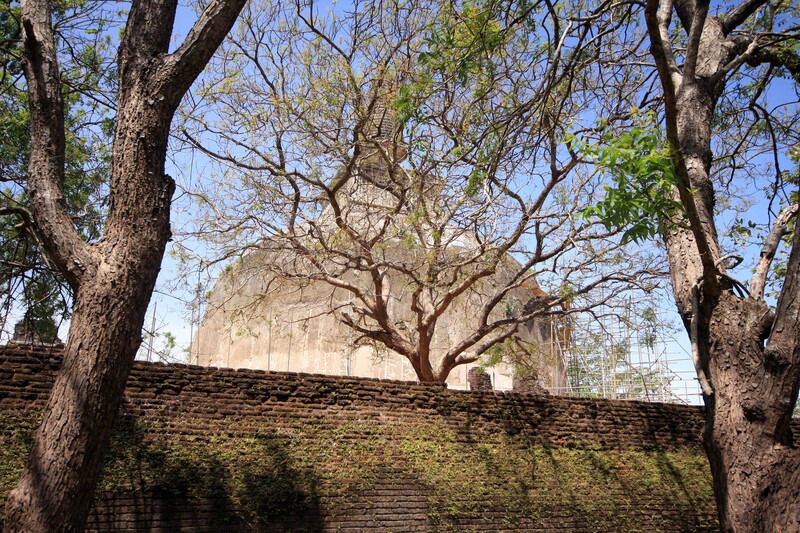 The ancient city of Polonnaruwa and the Archaeological Museum. There are 3 national parks in the district: Minneriya, Kaudulla and the Flood Plain. They all offer a good chance to see a lot of elephants close up. 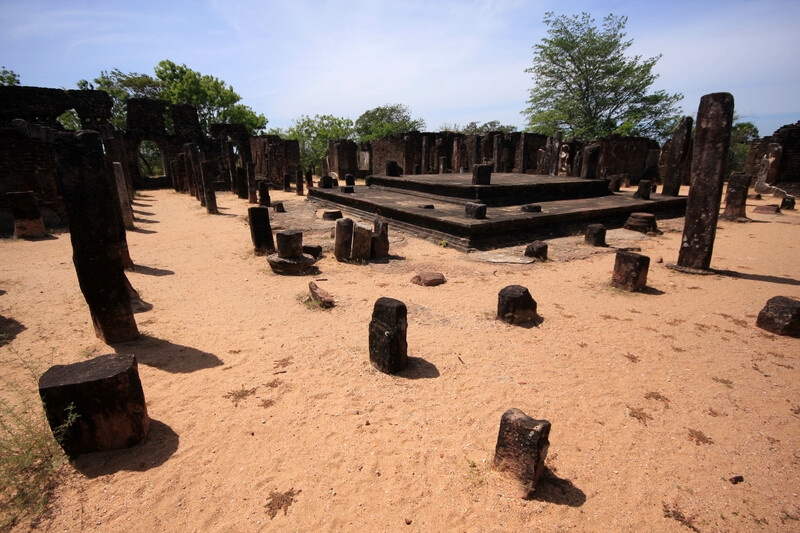 The 7th century Mandalagiri Vihara dagoba near Medirigiriya, about 30km north of Polonnaruwa. Getting here by bus is possible but it will take a long time. Hot water springsat Nelumwewa (Welikanda area), 30km from Polonnaruwa. Beautiful photographs. I especially like the Gal Vihare ones that are so beautifully lit that detail that is not visible in other photographs is revealed. 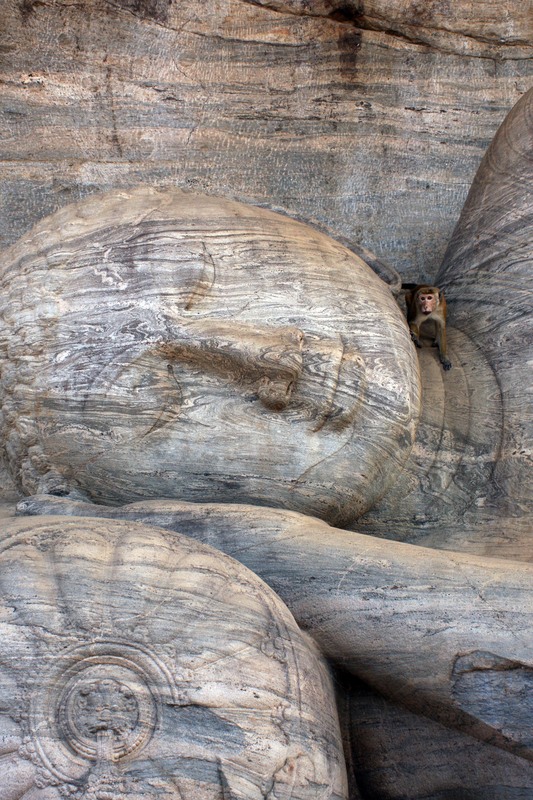 The monkey is a special delight! L.A.